Japan truly is a mystic island. In the middle of tall buildings, there could be found a tiniest rusty shrine. Palm size mountain of sault in front of a restaurant would welcome you at the entrance when you go out to eat at traditional Japanese place. In the mystic country, people start looking mysterious, too. They seem to be following common rules without any shared discussion to behave quiet, modest and be polite to others. (Please minus the time when they’re trying to get on a train during morning rush hour. They only mean to get to work on time!) There are numbers of things that would amaze you about the culture and the people. Yokai is perhaps one of the many things that fascinate you. You may say it is Japanese ghost. It is a whole group of supernatural spirits or demons or monsters, however you prefer to call it. It is sometimes a mix of legends of actual person and folklores and sometimes of gods. Painters during Edo period wrote Yokai encyclopedias and in recent era there is famous Shigeru Mizuki who successfully revived the popularity of Yokai and published comic books which became long run TV series called ‘GeGeGe no Kitaro’. But there are no clear answers to how many Yokai actually exist. It is said to be at least 1,500. Japan used to be a land of animism. People believed there are gods and spirits in any natural objects, phenomena, and in any humanly created objects. And the belief hasn’t completely worn off today. It became their way of life passed down from generation to generation. It is possible to imagine that Japanese tried to understand what they did not fully understand of as deeds of supernatural beings. It was how they coped with things. Japan has four seasonal changes every year with very humid and hot summer and freezing cold winter. During two rainy seasons it usually rains throughout those days with occasional glimpses of sky. And numbers of typhoons hit usually from summer to autumn often accompanied by lightning. This is how Japanese had to learn to be flexible, patient and tough. They also became very sensitive for slightest change in the air and leaves changing colors so that they know the season is in transition. In every transition of weather or phenomena, they saw gods and spirits. At the same time they found any occasion to get together for festivals. Festivals are traditionally set date for offering food and drinks to the gods and spirits to keep them happy so that they would only bring good fortune. It also worked as a bonding time between fellow villagers. Japan is surrounded with water and majority of the land is also occupied with mountains. People could not afford to fight each other, because it would not be easy to move away. This is how Japanese learned to be friends with almost any individuals despite their differences. You would notice the same thing about all the Yokai. They would usually have some comical side to them even when big part of their nature is to harm humans. For example, they often display rather childish character or have favorite foods humans would also like. It was how Japanese developed their complexed characters in many years that could describe how Yokai was born and have been co-existing with them. Usually found around river. They have a plate on their head and shell on the back. They enjoy wresting with children, but once the child loses they take out imaginal organ from the child’s bottom and pull them into water to kill. Their favorite food is cucumber. Often described as human alike creature with a horn or two on their head and sharp teeth. Their nature is to harm and eat human, but in some areas they are considered to be gods who drive away evil spirits to create more space for good luck to come in. Some are said to have turned into Oni from human after experiencing unbearable hardship in their lives or having too much of ill will. Usually in a form of small children living in human houses and playing practical jokes. It is considered they bring good luck and wealth to the house. Although not many, you’d still find some people serving daily food for this Yokai to keep them stay in the house. Their favorite food is rice cooked with red beans. Yokai is such a big part of Japanese culture that there is even a space for them to enter the anime world. ‘Ushino to Tora’ is one of the most favorites. story starts from a scene where Ushino finds a spear in a temple and releasing a Yokai attached to it by breaking the seal. Later he names the Yokai Tora. It turns out it is not just a regular spear. It was created in China more than 2,000 years ago with sole purpose of destroying Yokai. Soon the pair find themselves caught in position to battle Yokai. 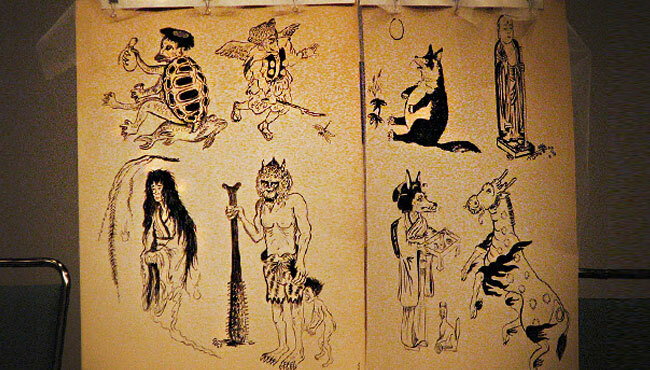 A religious group that was taking a roll of protecting Japan from Yokai notice the spear in use and Tora who was once very feared released from it. They start sending assassins to put full stop to the duo. To protect Ushino’s life, his father who is also a Buddhist monk at the temple tells his son to leave the house. Then he also reveals that his mother is actually alive and that he need to learn the secret about her life. Ushino and Tora start their journey trying to unfold secret of Ushino’s mother while fighting Yokai and assassins sent by religious group. What they did not know at the beginning was there was a downside to using the special spear. It was created by a man and he make it to possess magical power by sacrificing the life of his own sister, and he turned into handle of the spear himself. The spear is created so that it is capable of destroying any Yokai. But in exchange of sourcing the power form the spear, the user slowly loses his soul and turns into beast. Now this is all that I can tell you. If you want to know what happened to Ushino in the end, you can find the comic books and DVD at Amazon. mountains or somewhere traditionally considered sacred. Torii-gate is what separates the world of gods and spirits from our world. Take a bow when entering, do not walk in the center because it is for them. There may be people trying to make a short cut and entering the land without going through torii-gate. But please do go through the gate. It is considered a process to cleans yourself before entering sacred area. At last but not the least, here is very, very important thing for you to remember when you were to walk through torii-gate. Do make sure to pass through torii-gate when making your way out as well. True or not true, some people believe the only way to leave their world is through torii-gate. You would want to come back to where you’re from. For those of you who are thinking to yourself ‘Oops!’, be aware of strange happenings around you like losing your house key or being sleepy during broad daylight. Who knows if it is you or them? After all, this world is full of naughty Yokai everywhere.